Rabbis voice support for embattled Defense Minister following scathing criticism of US Sec. of State John Kerry. 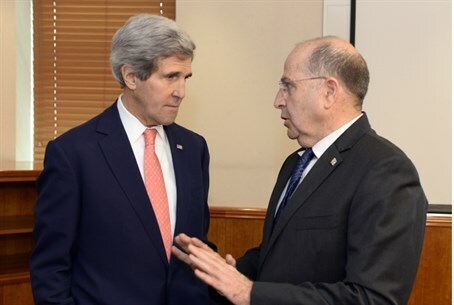 A group of more than 350 prominent Israeli rabbis has sent a letter of support and encouragement to Defense Minister Moshe Ya'alon, after comments he made about US Secretary of State John Kerry triggered a diplomatic backlash. The Rabbinical Congress for Peace (RCP) thanked Ya'alon "for his clear and fearless remarks that 'enough is enough'," referring to American pressure on Israel to cede land to the Palestinian Authority (PA). "At long last there is a cabinet minister who demonstrated what true Jewish leadership is - a man who had the courage to advocate the truth that is stated in the Code of Jewish Law (Orach Chaim, Section 329), that any withdrawal from Jewish territory leads to bloodshed," the letter read. "As Minister Ya'alon put it: 'Only our continued presence in Judea and Samaria and the Jordan Valley will ensure that Ben-Gurion Airport and [the northern city of] Netanya don't become targets for rockets from every direction," it continued. "This simple truth has been proved over and over again is recent decades. Any concession or withdrawal has led to bloodshed and instability and has made daily life miserable." In a private conversation Tuesday, Defense Minister Ya'alon leveled scathing criticism of the US-sponsored "peace plan" between Israel and the PA, saying it did not adequately address Israel's security concerns over ceding the strategically-important Judea and Samaria region, and dismissing US security proposals as "not worth the paper it was written on." More controversially, Ya'alon attacked Kerry personally, branding him "obsessive and messianic" over his relentless shuttle diplomacy and efforts to impose terms on Israel. The comments quickly elicited criticism from the US as being "offensive and inappropriate," and in response an embattled Yaalon apologized on Tuesday for any offense caused - though notably he did not withdraw the comments nor deny saying them. But a number of prominent Israelis have spoken up for him, including a senior military veteran. Likud MK and fellow coalition member Tzipi Hotoveli criticized Ya'alon's decision to apologize, saying that the White House's stance is disconnected from the reality of the situation in the Middle East. Despite voicing staunch support for Ya'alon, RCP Executive Director Rabbi Avrohom Shmuel Lewin emphasized that ultimately, "Secretary of State John Kerry is not at fault." "If we already convinced him that he can gain from Israel’s continued painful concessions and withdrawals, why shouldn’t he continue to pressure Israel for even more concessions?" asked Rabbi Lewin. "The only course to take now is to make him face the reality as delineated in our Torah - that there never was and there will never be genuine peace and stability in the region through Israel’s compulsive withdrawals and concessions. This will not harm our relations with the U.S. because the U.S. has no interest in leading to more bloodshed and instability in the region." "In contrast with the 'festival' of 'Jewish leadership' that the media has been portraying in the past few days, a true leader is one who is not fazed by the media," he said. "A true leader does not cave in to deceptive diplomacy."